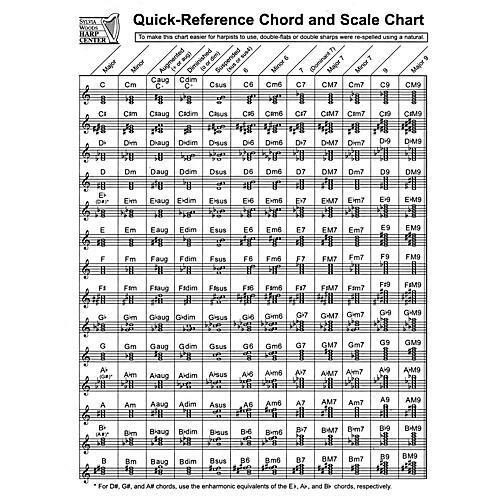 This easy-to-read chord and scale chart by Sylvia Woods has everything you need for quick reference on one laminated, 2-sided, 3-hole-punched, 8 1/2 inch. x 11 inch. sheet. It includes the chord construction for every major, minor, augmented, diminished, suspended, 6th, minor 6th, dominant 7th, major 7th, minor 7th, 9th, and major 9th chord. It also includes intervals, inversions, parts of a chord, chord intervals, scales, modes and key signatures. Concise and complete, no musician should be without one!